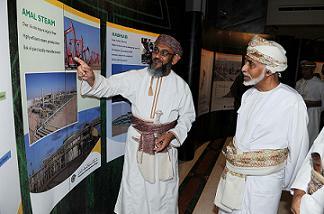 MUSCAT — His Majesty Sultan Qaboos yesterday visited Petroleum Development Oman (PDO) at Saih Al Malih. His Majesty the Sultan was greeted at PDO’s main building, Beit Mina al Fahal, by ministers, PDO General Manager, government representatives in PDO Board of Directors and members of the company’s senior management. His Majesty the Sultan made an inspection tour of the premises and was briefed on some important projects being implemented by the company in its concession areas that are expected to boost the Sultanate’s future oil and gas production and reserves. 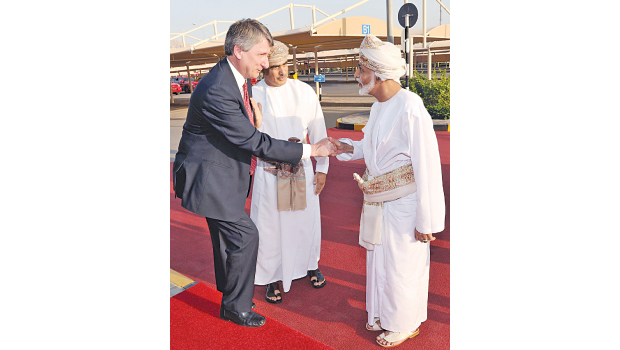 The landmark visit comes on the back of a “record year” enjoyed by PDO in 2012, with the Sultanate’s flagship oil company registering its highest ever hydrocarbon (oil, gas and condensate) production in its history: 1.24 million barrels of oil equivalent (boe) per day. This exceeded the previous best of 1.21 million boepd in 2001. Daily oil production during the year stood at 566,305 barrels per day (bpd) and above PDO’s long-term plateau target of 550,000+ bpd. Daily production of non-associated and associated gas stood at 582,500 boepd with condensates at 92,500 bpd. The combined yield meant it was the fifth successive year that the Company had increased its aggregate production figure. 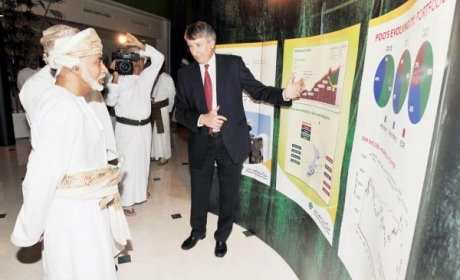 PDO accounts for around 70 per cent of the Sultanate’s crude oil production and nearly all of its natural gas supply so there is a huge onus on us to find and develop new fields of a challenging or “unconventional” nature to replace those that are declining. Despite its record performance, the company has vowed to remain as committed as ever to its primary goal of exploring and developing hydrocarbons in a sustainable, efficient manner to the benefit of all its stakeholders by using new technology and pioneering techniques such as enhanced oil recovery (EOR).Earlier this year, PDO announced a significant gas find in the northern part of its concession area. Mabrouk Deep, some 40 km west of Saih Rawl, Oman’s main gas field, has estimated in-place volumes amounting to 2.9 trillion cubic feet (tcf) of gas and 115 million barrels of condensate. Exploratory drilling took place last year at depths of up to 5,000 m and a large field of some 60 km2 was located. In addition, there were five new oil discoveries in 2012, amounting to approximately 300 million barrels of stock tank oil initially in place (STOIIP) from Shuaiba and Gharif reservoirs. SMS from PDO MD to PDO Staff and Retirees – May 12th 2013.